The LAKE STREET CREAMERY interview: The kitten stays in the picture. In the summer dessert smackdown, you have your pie purists in one corner and watermelon aficionados in the other but Ms. Go Go is willing to bet that really, in our collective heart of hearts, we all scream for ice cream. Lake Street Creamery’s ice cream, served in waffle cone bowls, comes in flavors like: “Donut” (Ms. Go Go’s Teen Taster pronounced it “more like donut holes, which are better”); “Pancake Breakfast” (toothsome bits of pancake and bacon, flavored with maple syrup and sprinkled with peaberry coffee); and Ms. Go Go’s personal favorite, “Aztec Sacrifice” (“Ghirardelli chocolate, chilis, cayenne, and the blood of a thousand virgins.”) Ms. Go Go can attest that the latter ingredient adds a definite, piquant touch…. You can also get any of the ice creams as soda or iced coffee floats. Suggested pairings include the not-for-the-faint-of-heart “Weird Creep” (Black Jack/licorice ice cream in grape soda) but you can mix and match ice creams and beverages to taste . On her next visit, Ms. Go Go plans to mix the Aztec Sacrifice with iced coffee and figures that she’ll either build an empire on the spot or her head will explode with excitement. In between wrangling cats and Weird Creeps, Beth gave Go Go’ers a peek behind the Lake Street Creamery curtain. Ms. Go Go: So…delish ice cream, crazy flavors…what was the inspiration? Beth @ Lake Street Creamery: It all started at a dinner party. Tim was experimenting with Donut, and our friends were so excited by it they put the idea in our heads to sell it. We thought it might be fun and started creating all kinds of unusual flavors. 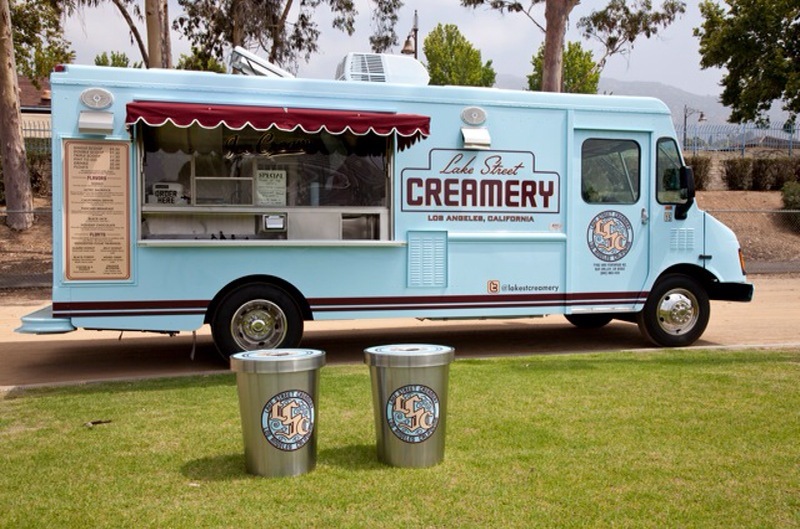 What’s behind the Lake Street Creamery name? It’s pretty simple. We live on Lake Street. Seriously. That’s it. And it rolled off the tongue nicely, so it stuck. We couldn’t find any virgins in LA; in the end we had to go with a synthetic virgin-blood substitute. And breakfast is delicious, but we are lazy. Making ice cream is a lot less work than professional cooking, and even so it takes all our time. We seriously have no idea how real chefs do it. Components of your success: making yummy ice cream, writing sassy manifestos, shooting shameless videos of kittens. How do you divide the labor? It’s just the two of us, but we work brilliantly together, so it flows well. There isn’t really much of a division, except that I do most of the actual ice-cream manufacturing in exchange for not having to drive the truck. Despite the offbeat/gourmet flavors, Lake Street Creamery has a very Americana feel. Was this intentional (and if so, why?) or are you guys from the Midwest and your roots just permeated the endeavor? Tim is from Georgia and I am from Northern Cal, but we both are obsessed with the mid-20th century, and specifically LA in that period. For us the 1940s are as relevant as anything that happened five years ago, but we aren’t what Tim calls “retro merchants.” We’re not trying to create a Disneyland past. We like things that blend the vintage with the modern — things that look eighty years old from a distance, but when you look closely, there’s something skewed about them. We thought our brand should have a personality, and the simplest and most fun route to that was just to use our own personalities. Per the Lake Street Creamery website, your edible waffle bowls are a “futile attempt to save the planet”. (Say it ain’t so, Beth and Tim!) What are some of your other sustainable efforts? We use paper straws, wooden spoons and paper cups and all glass for drinks. We aren’t huge fans of plastic (although the hula hoop is genius). We wanted to try to be conservative with waste, and we recycle all our bottles. We’re not militant green, but we wanted waste that would biodegrade, like, eventually. Plus, everything tastes better out of a glass bottle, and looks pretty cool too. A) Was that part of the marketing plan all along or a last-minute inspiration? A) We wanted to do YouTube videos for LSC from the get-go. We had an ad planned to film ourselves which had no kittens in it (we still do), but fate intervened when our cat Scout got knocked up, and little Scout Jr. arrived with five other adorable kittens. The slap video was not planned. We couldn’t have made that happen if we tried, and we certainly didn’t try! Our only plan was to film our kitten in a tiny hat because it was funny. After the Speedo slap went viral, we decided immediately to make a Lake Street Creamery ad with Scout Jr. We knew that rehashing the slap and incorporating that would be kind of dumb, so, true to our philosophy, we just made the kind of thing we wanted to see. Most of the credit goes to Scout Jr., however. On take four she did the cutest things imaginable and we stopped shooting. B) Can we expect more Scout Jr. videos in the future? B) There are more videos in the works, which ought to have been done already. But unfortunately, our marketing department is staffed by the same two people who are staffing our manufacturing, transport, retail, and janitorial departments. We do have some very cool surprises coming up, though. C) Will fame and Lake Street Creamery’s success go to Scout Jr.’s head? C) All of our cats think, quite rightly, that they are the center of the Universe. Scout Jr. is no exception. Thanks, Beth, Tim, Speedo and Scout Jr.! Previous Post Downtown breakfast…with goats. Too cute. I want the kitty and I want the ice cream. Must find. I don’t think the kittens are for sale but you must find the ice cream. I bought four pints and we ate most of it for dinner…. Hey, it’s summer!